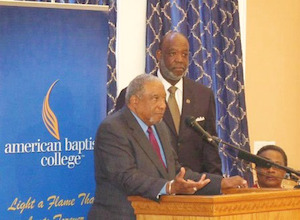 Civil rights activist Bernard Lafayette, left, and school President Forrest Harris Sr., are proponents of American Baptist College’s designation as an HBCU. In the early 1960s, the Nashville school then known as the American Baptist Theological Seminary stood shoulder-to-shoulder with local institutions, including Fisk, Vanderbilt and Tennessee State universities, based on the willingness of their students to put themselves on the front lines of the Civil Rights Movement. Among those engaging in nonviolent lunch counter sit-ins and the Freedom Rides, American Baptist students such as John Lewis, Bernard Lafayette, and William Barbee shaped a legacy of activism of which the Nashville school remains deeply proud after more than 50 years. More recently, the school, known now as American Baptist College, has attained what college officials consider its latest honor—federal designation as a historically Black college or university. On March 20, the U.S. Education Department informed the school that it qualified as historically Black college and university (HBCU) status and that it is eligible for federal grant and funding opportunities available to HBCUs, according to U.S. Education Department spokesman Jim Bradshaw. “To be eligible for designation as an HBCU, one has to be founded before 1964 and whose mission is to train and educate predominantly African-American populations … . We think it’s an important designation,” American Baptist College president Forrest Harris Sr. said Wednesday, noting the school was founded in 1924. “We qualify based upon our mission. We thought it would be good for us to be grandfathered in to the official list of HBCUs,” he said. Having formally applied for HBCU status in summer 2012, the designation “deems the school eligible for congressional appropriations for strengthening HBCUs,” according to Harris. He said that American Baptist College can now receive the yearly federal appropriations that go to individual HBCUs. Although the award amount varies from school to school, the minimum for the formula-based funding is $250,000 per institution, Harris explained. The college is now the 106th institution in the U.S. to hold the designation. When the “college was founded in 1924 as a school to train rural clergy, it was designated as a seminary,” Harris said. “Over the years, it changed from a seminary to a liberal arts college. And it has been accredited as a liberal arts college since 1971,” he noted. Dr. Renita Weems, the American Baptist College (ABC) vice president and academic dean, credits Harris for launching an effort three years ago to improve the school’s academic program such that it would be ready to apply for HBCU status. The school, which has 150 students, has added a new major in behavioral studies and will add two new majors in the next year, she said. “We also expect to see our enrollment double by the fall,” Weems said, noting that ABC is undertaking an effort to boost enrollment as it adds new majors. Coincidentally, when American Baptist College (ABC) officials organized a campus event around the HBCU designation earlier this month they used the occasion to announce that Belmont University, another Nashville-based school, was donating $100,000 to ABC to set up an endowed scholarship fund for ABC students. “It was quite an opportunity for two major events to come together. They were not directly related. Our relationship with Belmont University has been ongoing for a number of years,” Harris said. The Belmont University gift resulted from past conversations between Harris and Belmont University president Robert Fisher about racial issues and racial disparities, according to Harris. The two had discussed the economic gap in endowments between historically Black colleges and other schools. “We together were trying to imagine ways in which investments could be made for young people, particular the type of young people that American Baptist College has educated,” Harris said. “It was a unique time and opportunity for one university to contribute to the endowment of another, which is unprecedented. It makes a bold statement,” he noted.